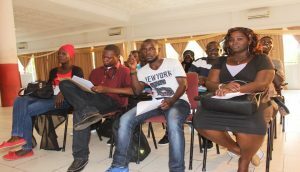 Special Movie Award under the auspices of afrinity productions recently convened a press conference for the maiden edition of the special movie award dedicated to recognize the work of filmmakers and actors in The Gambia. This according to organisers is to celebrate films made in the Gambia, promote qualitative film contents, encourage the art of film making and to recognize key players in the industry and support film productions in the country. Speaking at the conference, Franklin Adim, the program/Award coordinator of special movie awards (SMA) said afrinity productions is a recognised media house in the Gambia and has come up with this initiative. Also speaking at the conference, Sheikh Tijan Sonko, the producer of the SMA, said: “The maiden edition of SMA is to celebrate together with Gambian film makers and actors to at least recognize them. There are lot of people that are not aware of the good work the film makers are doing and we also want to at least promote quality films in the Gambia. Winners of the maiden edition will go home with certificates, a trophy and cash, according to the organizers of the event. Special Movie Awards 2016 (Maiden Edition) is a night of glitz, glamour and paparazzi it is a night of unforgettable experience for movie starts to celebrate creative titles, diverse languages, beautiful colors, melodious sounds, graphical effects, styles and actions. By Samsideen Ceesay & Juldeh Njie The Standard Newspaper, The Gambia.